Set a large, 1-gallon stockpot filled with water to a boil and season with 2 tablespoons of the salt. Add the linguine to the pot and stir until the water returns to a boil. 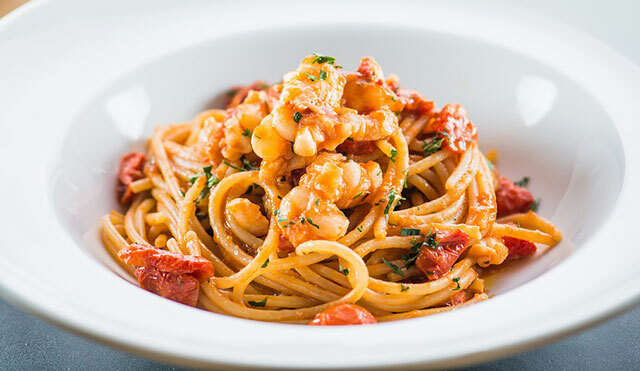 Once the pasta is cooked, but still slightly firm, or al dente, remove from the heat and drain, reserving ½ cup of the pasta cooking water separately. Place the linguine in a large, warmed bowl and drizzle with 2 tablespoons of the olive oil. Wrap with plastic and set aside as you finish the sauce. While the linguine cooks, make the sauce. Set a large, 14-inch sauté pan over medium-high heat. Add the remaining 4 tablespoons olive oil and the onions. Sauté the onions until lightly caramelized, about 3 to 4 minutes. Add the garlic, Essence and red pepper flakes to the pan. Toast the garlic until browned, about 30 to 45 seconds. Add the white wine to the pan and cook until nearly completely reduced, about 2 minutes. Add the tomato paste, crushed tomatoes, reserved pasta cooking water, and 1½ teaspoons salt to the pan. Bring to a boil, cover, and cook until the sauce is slightly thickened, about 4 to 5 minutes. Add the shrimp, clams, mussels and basil to the pan, cover, and cook until the clams and mussels open, about 4 to 5 minutes. Toss to combine, and remove the sauce from the stove. Add the pasta sauce and parsley to the cooked pasta and toss to combine. Serve with parmesan for garnishing.